It’s hard to remember a time when it was a struggle to lug your luggage through an airport, but it did exist. Travelers had to literally manhandle their suitcases using the handles throughout the airport and to hoist 30 – 40 pound bags onto and off baggage carousels. But everything changed when one airline professional grew weary of the process and decided he could make it better. Northwest Airlines 747 pilot, Bob Plath, crisscrossed the globe a thousand times over, suitcase in tow. He’d seen firsthand what happened to his luggage and those of others over time and saw the toll it took on travelers hauling it through terminals. He thought there had to be something better. When he discovered there wasn’t, he invented it. What Plath created in his garage in 1987 was completely revolutionary. Before his brainchild, all luggage was oriented horizontally. Heavy, inflexible suitcases with handles on top that had to be carried through airports. The only other integrated rolling option was a horizontal model featuring four small wheels and a strap for pulling, that collided with your heels due to the poor balance and ergonomics. Plath’s innovation began with reorienting his bag vertically, and placing larger, stable wheels and a retractable handle system. Soon fellow pilots and flight attendants began asking him to make what he coined the Rollaboard® for them. When passengers began noticing and asking airline personnel where they had purchased their bags, Plath moved the operation out of his garage into a 185,000 square foot warehouse. He left Northwest in 1991 to focus solely on what has become the industry standard in luggage and the precursor to all other upright, wheeled luggage rolling through the world’s airports. Airport security procedures and equipment were standardized to accommodate increased use of carry-ons. Airlines reconfigured their fleets with overhead storage bins that could hold the new carry-ons. The struggling luggage industry was revived as travelers replaced old horizontal luggage with the much easier-to-use Rollaboards®. Other manufacturers scrambled to develop products that would compete with the new standard. The tourism industry also received a boost as travel was simplified for everyone, regardless of their conditioning or physical limitations. Today, our garment bags, suitcases, executive rolling briefcases, rolling duffel bags, rolling totes, and checkpoint-friendly backpacks are the choice of over 90 airlines and frequent travelers worldwide. This week, we’re celebrating how our founder’s revolutionary innovation changed travel as we know it by offering you 15 percent off all Rollaboard® models from our TPro® Bold™ 2.0, Maxlite® 5, Crew™ 11 and Platinum® Magna™ 2 series when you visit www.travelpro.com. Are you old enough to remember those hand-carried suitcases? Or are you fortunate enough to have never been saddled with them? Do you have any great stories to share about the first time you ever used a Rollaboard, or the last time you hand-carried your luggage? Share them with us in the comments below, on our Facebook page, or in our Twitter stream. The operative word in luggage shouldn’t be “lug,” and Travelpro knows you need the freedom to pack everything you need without being weighed down as you navigate the airport terminal, hotel lobby, or cruise ship gangplank. The Maxlite® 5 Collection — the result of its latest efforts in innovation, functionality, and durability — is up to half a pound lighter than its predecessor, the Maxlite® 4. Basically, it weighs as much as your average Chihuahua. At just 5.4 lbs., the Maxlite® 5 21” Exp Spinner and 22” Rollaboard® retain all the quality materials, rigorously tested durability, and thoughtful design you’ve come to expect from Travelpro’s collections. It just weighs less so you can thoughtfully pack as much as possible without being concerned about your bag adding excess pounds to your business trip or vacation. While other soft-sided luggage might seem lightweight, words such as strong, tough, and durable mean what they say when we talk about the Maxlite® 5 Collection. 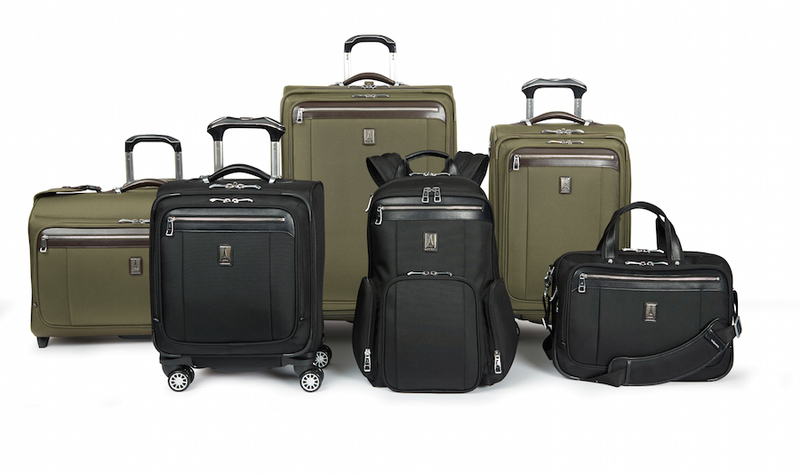 Built using lightweight materials that resist wear and tear, even through the most rigorous use, this Collection has 16 options, from carry-on totes, garment bags, and backpacks to smooth gliding Rollaboard® and 4-wheeled Spinner models in multiple sizes, Maxlite® 5 is a comprehensive assortment. Just because you’re choosing Maxlite 5 doesn’t mean you’re sacrificing anything! Let’s start with the Rolling UnderSeat Carry-On, which, just like its name implies, fits under seats of most major domestic airlines. With its many compartments and specially-designed pockets, such as a removable plastic compartment for cosmetics, office supplies, or electronics accessories, you’ll be so organized you won’t know how you ever traveled without it. The 21″ Expandable Spinner and 22″ Expandable Rollaboard maximize your packing power and allow you to glide through security to your gate on their high-performance wheels. Both are only 5.4 pounds, and for those who are planning longer getaways that necessitate checking your luggage, the 25″ Expandable Spinner is only 7.3 pounds. All bags feature Travelpro’s DuraGuard® coated fabric that resists water and stains, as well as extra strong PowerScope Lite handles on rolling models and many pockets to help you pack to the max. All are backed by the Built For A Lifetime Limited Warranty. In addition, if you register your bag within the first 120 days of purchase or gift receipt the new Trusted Companion Promise enhancement gets activated which covers damage caused by airlines or other common carries for the first year! That’s a major warranty upgrade! If you’re traveling abroad and want an ultra-lightweight carry-on that will go the distance, check out the Maxlite® 5 International Carry-On, both in 2-wheel Expandable Rollaboard® and 4-wheel Expandable Spinner models. Both models meet the carry-on size restrictions for most international airlines, you’ll find either of these compact but capable, allowing you to travel light and travel right. 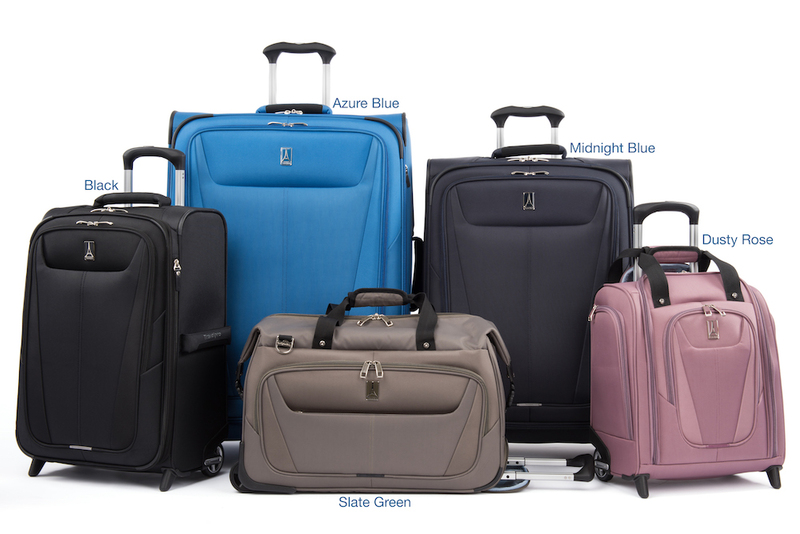 All models in the Maxlite 5 Collection are available in black and exclusively on Travelpro.com in midnight blue, and other color options include azure blue, slate green, and dusty rose. Our very own Scott Applebee appeared on a recent episode of Rudy Maxa’s World with The Careys, the world travel radio show and podcast from travel expert Rudy Maxa. Scott talked with hosts Robert and Mary Carey about the history of Travelpro luggage, and the important role played by Bob Plath in developing the Rollaboard suitcase, which launched our entire company and changed the industry. You have to go back quite a ways in luggage history to find suitcases that do not have wheels. 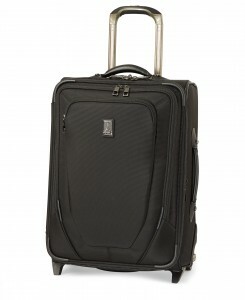 Once reserved for larger suitcases to help manage the weight, now almost all carry-ons and larger suitcases use wheels. First, we divide our luggage into two types: Rollaboard® luggage and Spinners. While generally referred to as “upright suitcases” or “rolling suitcases,” we use the term Rollaboard luggage — since we invented the bag in the first place — and define this class as upright luggage that has only two wheels. These two in-line wheels are much like those on rollerblades and are larger in diameter than those found on spinners. They are built into the bag and do not protrude completely from the base of the luggage. This offers crash guard protection so the wheels last longer and function better. Typically, the higher-end luggage wheels contain sealed ball bearings so grit and grime cannot affect the wheel’s ability to roll smoothly. Because of their larger circumference, they maneuver better on carpeted areas and rougher terrain, like streets and brick roads. Spinners are the next class of wheeled bag, and their wheels are placed in each corner of the case. They’re different from wheels on Rollaboard luggage in that they rotate 360 degrees, allowing you to push it alongside you as you walk through an airport or pull it behind you. You can make sharp turns, and the wheel mechanism will turn with you. There are two classes of Spinners — 4-wheel and 8-wheel. Four-wheel Spinners have one wheel at each corner and eight-wheel Spinners have two positioned at each corner. What we’re especially proud of in our own Spinner wheels is an innovation called MagnaTrac™. Most Spinner luggage drifts or pulls, putting a strain on your shoulder, arm, wrist, and hand, as you fight to keep it in line. MagnaTrac wheels have magnets built into the wheel’s neck, so that the wheels automatically align as the bag is pushed along beside you. This patented technology keeps the bag moving straight and it doesn’t fight you. This means you’re not working as hard to move your bag through an airport or hotel lobby, and your trip will be that much easier. Do you have any questions about wheeled bags? Which ones do you prefer? Ask your questions, or leave a comment, in the comments section below, or on our Facebook page. Choosing Luggage: A Whole Set or Individual Pieces? Luggage is a very personal purchase, as personal as buying your own clothes or even a new car. Not only does what you buy need to meet specific travel needs, it’s an expression of personal taste and the statement you want to make to your fellow travelers. Let’s consider buying the luggage set versus the individual piece. If you purchase a set, all the pieces in that set are designed to the same specifications. Travelpro has 11 different lines because we’ve studied the many different factors that determine each traveler’s purchase. Each collection is manufactured to meet the specific rigors of that particular travel experience. Material, hardware, and framework are all chosen carefully in order to design the best pieces for each type of traveler. The business traveler, for example, may need a briefcase and a carry-on Rollaboard in order to avoid time spent waiting at the baggage carousels. The leisure traveler may do most of his traveling by car, or may want varying sizes of luggage for different members of the family. The weekend blitz trip versus the over-the-river-and-through-the-woods extended stay for the holidays is also part of the decision of set versus individual pieces. The adventure traveler may want flexible luggage that doesn’t add weight to an outdoor backpacking trip. Purchasing several essential pieces at the same time from the same collection will ensure that you have the same look. It will also ensure that you are looking for only one color or style of luggage when multiple pieces are used during a trip. It is also important to realize that pieces in a collection all meet the same specifications and will perform similarly. If a single piece already sits in your closet and you’re looking to add another, determine first which way you travel the most. Purchase the piece or pieces that will best meet your needs. If what you own is part of a set, consider those pieces first, particularly if you’re pleased with the performance and functionality of your current luggage. If you own a stand alone piece, realize that there probably will be only a few times when you use both of them at the same time. If you are adding a piece to create a set that will be used together, determine whether color matching or construction is important to you. Eclectic is just as chic as a matching set. When considering adding to your travel collection, whether you choose an individual piece or a set, each piece will serve you best if you’ve really thought through its function. What’s the one piece you want to add to your collection, or what’s your favorite piece? Let us hear from you in the comments below or on our Facebook page. The T-Pro® Bold™ 2.0 Collection by Travelpro® is ready to go anywhere in the world at a moment’s notice, over rough terrain or down busy city streets. Amazingly durable, lightweight and versatile, this 9-piece collection is perfect for individuals and families with a sense of adventure. Loaded with extras, creature comforts and flexible packing options, Bold 2.0 embodies Travelpro’s next generation of action luggage. 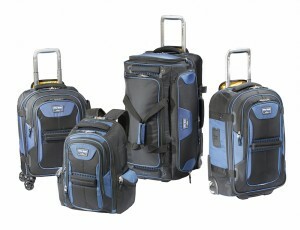 Our Tpro Bold 2 line of bags includes rollaboards and duffel bags. Made of high-density polyester fabric with a water-repellent coating for greater stain and abrasion resistance, this rugged line features a comprehensive offering, including Spinner and Rollaboard® models, a backpack, a soft duffel bag and two drop bottom rolling duffel bags. Multiple carry handles make the luggage easy to transport in and out of a car or airplane overhead bin. The drop bottom rolling duffel models include a zippered divider panel for two separate packing spaces or, if opened, one large main compartment. The backpack, 22″ Rollaboard and 21″ Spinner models provide a padded tablet pocket for protection and easy access during travel. An “intelligent” interior on Spinners and Rollaboard models offers packing flexibility with a mesh pocket and wet pocket, ideal for toiletries or wet clothing, built into the lid. Available in distinctive blue and purple fabric colors with black accents, the T-Pro Bold 2.0 Collection includes 21″ and 26″ dual spinner wheel models that allow an effortless roll in any direction, making it easier than ever to maneuver through crowded airports and airplane aisles. Moreover, an aircraft-grade aluminum telescoping handle system is strong enough to support a tote or case, and protective wheel housings, skid guards and molded rubber corner guards for crash protection. Compression straps provide extra security, while a hidden back pocket allows quick access to keys, electronic cables, phones and more. For over 25 years, Travelpro International has prided itself on design innovation and durability in crafting the highest quality luggage for travelers worldwide. Since transforming the ease of modern day travel with The Original Rollaboard® wheeled luggage, Travelpro has been the brand of choice for flight crews and frequent travelers on every continent. The company is dedicated to building a lifelong relationship with its customers by consistently meeting and exceeding their expectations. Travelpro was honored to once again be voted as the “World’s Best Luggage” by Premier Traveler Magazine in 2014. Please visit the Travelpro website for a full list of the latest products and retail locations. You can also like us on Facebook and follow us on Twitter at @Travelprointl. Bring This, Not That: Backpack, Rollaboard, or Duffel Bag for a Carry-On? We’ve talked before about the different benefits of backpacks, rollaboards, and duffel bags and we definitely think that each one has a particular area where it shines. 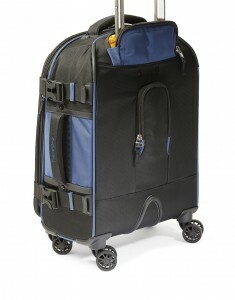 The regular business traveler might favor the rollaboard, while the college student would enjoy the backpack. And travel writer Mark Eveleigh has waxed rhapsodic about the duffel bag. So is there a “best bag” to bring on your next trip? It depends on the size of the particular bag and the length of the trip. On the business side, the backpack has almost been a replacement for the briefcase, especially among younger people, particularly when you’re talking about the business-style backpack. When you actually do travel, you can use your backpack and a rollaboard at the same time. 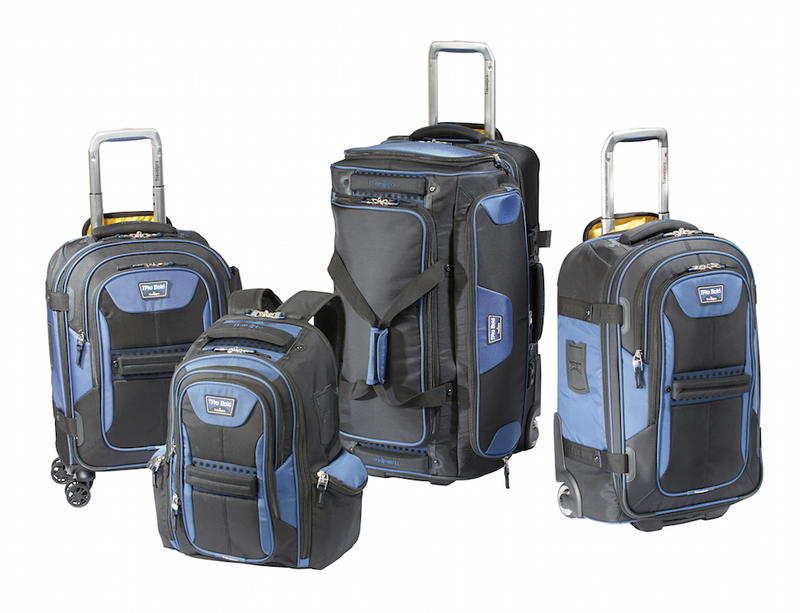 Our Tpro Bold 2 line – duffel bags, rollaboards, and backpacks. The backpack will carry your work essentials for a business meeting, to visit a client, or to give a presentation. The rollaboard takes your clothes and toiletries. And if you have a Travelpro backpack, there’s even a strap to slide over the rollaboard’s extended handle. The duffel bag could be, depending on its size, a replacement for the rollaboard or backpack. These are very useful for non-business type trips, but could require some more energy and forethought. In terms of plane travel, the rollaboard usually can’t fit under the seat in front of you, so it would have to be stored in the overhead bin. Also, rollaboards have wheels, which are great for pulling the bag behind you, but you can easily set duffels down, and as long as you’re carrying them, they’re all-terrain bags. Mark Eveleigh and his girlfriend, Narina Exelby, are adventure travel writers who have a strong preference for duffels because they don’t like toting backpacks around on their backs, and instead look for duffels with heavy-duty wheels. As is often the case, you need to think about the nature of your trip. Make sure you have the right piece for the particular trip you’re going on. They can all be useful in different situations: rollaboards are great in the city, while duffel bags are better for weekends in the cabin or if you’re going to do a lot of hiking. And backpacks are just great all around for your smaller items and work essentials. Which is your favorite? Let us hear from you. Leave a comment below or on our Facebook page. Travelpro once again redefines premium travel products with the Platinum Magna 2 handsomely crafted luggage collection featuring superior fabrics and genuine leather accents. This ultra-durable 13-model series is the pinnacle of fashion, intelligent functionality and design innovation. The result is a truly luxurious offering for travelers who want the finest in quality and performance. 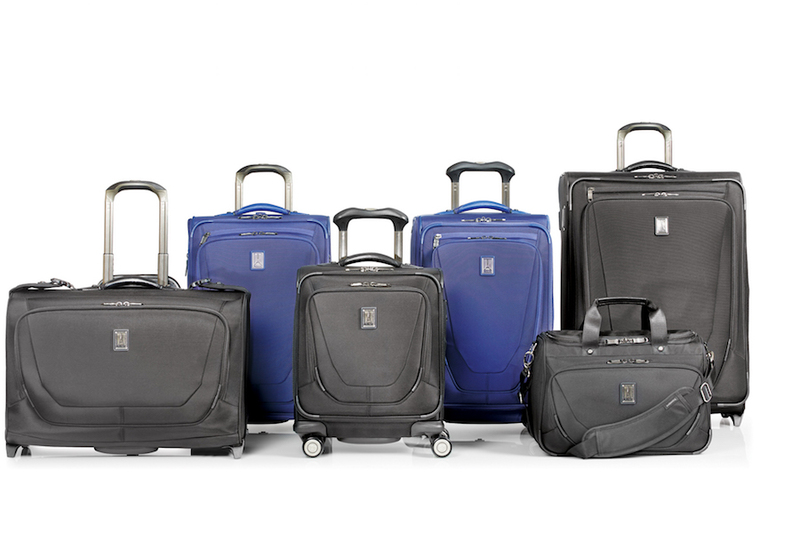 Backed by Travelpro’s Worry-Free Warranty, Platinum Magna 2 ensures a lifetime of satisfaction with Spinners, Rollaboards, Garment Bags, a Business Case and a Backpack included in the collection. 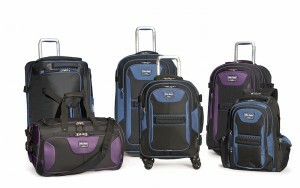 This full line features 9 carry-on bags, providing many different options for today’s savvy traveler. Designed for the “Perfect Roll,” the Dual Spinner Wheels include Travelpro’s patented MagnaTrac wheel technology, a leap forward in Spinner luggage. When Platinum Magna 2 is pushed, magnets instantly align the wheels to roll straight in any direction. 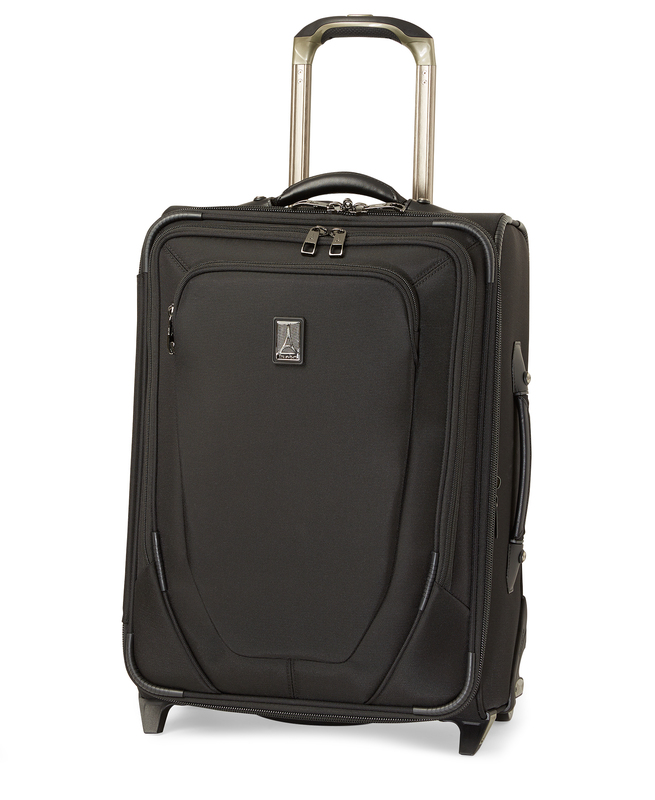 Most spinner luggage drifts or pulls to one side or the other, putting strain on your shoulder, arm, wrist and hand. Platinum Magna 2 tracks effortlessly wherever you want to go. The patented Contour Grip on Spinner models provides superior ergonomic control, relieving fatigue on the shoulder, arm, hand and wrist. In combination with the patented PowerScope Extension Handle that minimizes wobble, these two features provide the traveler with the ultimate in comfort, functionality and strength. Rugged, fashionably textured nylon fabric with DuraGuard coating features stain and abrasion resistance for greater durability, while the H2O Guard coating protects the interior lining from stains. The Platinum Magna 2 collection is available in attractive black fabric with black leather accents and olive fabric with brown leather accents. The Carry-on Rolling Garment Bag helps keep clothes wrinkle free. The convenient split-design construction offers amazing packing capacity and multiple pockets to store clothing, cables, socks, and so much more. The Business Brief and Backpack are fully compatible with the luggage in the collection. They include padded laptop and tablet pockets along with a business organizer for intelligent storage of quick access essentials. Travelpro has reached new innovative heights with its introduction of the Maxlite Hardside Collection, a breakthrough in hardside luggage durability, style and value. This amazingly lightweight 4-piece series consists of a Business Plus, 21″, 25″ and 29″ expandable hardside spinner models which feature a strong 100% polycarbonate hard shell for ultimate protection. The patented Contour Grip provides superior comfort and control to an 8-wheel spinner system that rolls effortlessly in any direction. The roomy main compartment expands 2″ to maximize space and packing flexibility. This series is packed with extra touches, such as a telescoping aluminum, airline-grade handle which adds strength and stability and has stops at 38″ and an extra-tall 42.5″ to accommodate users of different heights. Durable crash protection is provided by protective side feet, molded wheel housings and built-in skid guards. High mileage travel is a breeze with high-performance wheels that are tested to the same standards as those of our more expensive collections. To secure the luggage contents, the Maxlite Hardside series utilizes high-tensile strength zipper pulls to fasten directly to the built-in TSA lock. Split construction allows for easy packing of clothes and contents within two full compartments which include a built-in mesh pocket handy for electronics, power cables and cords. 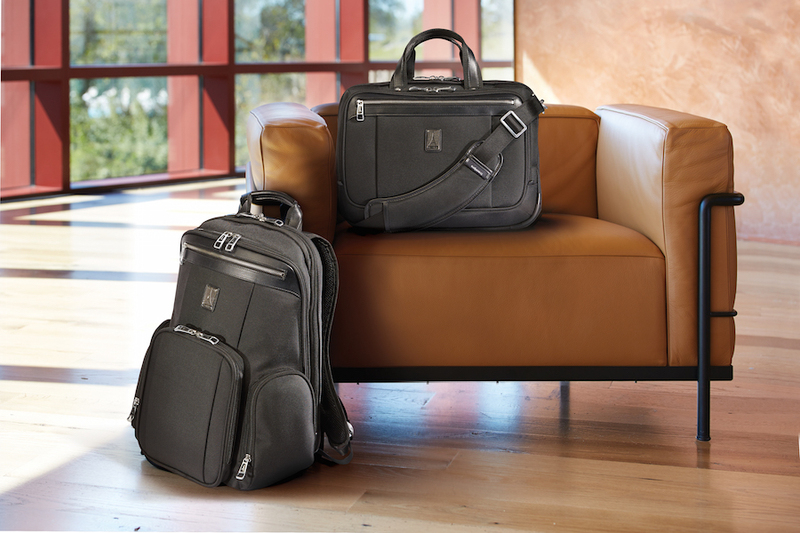 Travelpro offers business travelers a great option — the Maxlite 19″ Business-Plus Hardside Carry- On. Unique to this model, the Business-Plus has a full exterior pocket that opens for easy access to a business organizer for storing files, paperwork, a cell phone, pens, cables and more. Two padded sleeves conveniently store and protect both a laptop and a tablet. Available in grape and black glossy shell colors, the Maxlite Hardside Collection is a bold fusion of fashion and functionality. A recent article on the PSFK.com website discusses the emergence of a way more convenient form of travel. The Embraer Air E2 jet seeks to maximize the room for your carry on luggage as well as make the flight itself more comfortable. There’s 40 percent more room for luggage onboard the plane, and you can actually fit an airline standard piece of luggage in the overhead bin, wheels first. Not having to obsess over the size of your suitcase would be a wonderful feeling. Plus, each traveler has a lot of personal space. Seats move around independently, and there’s enough room for it so no one will yell at you for leaning back or putting your knees in the back of their seat. The seats can even be staggered so you’re not directly next to the person in your row. The designers tried to rethink the way flyers experience their trip, so the planes were designed to be more comfortable and personable. They wanted to give passengers a feeling of having their own territory during the flight. The Embraer Air E2 jet is slated to come out in 2018. However, it may not be very likely that the weary American traveler will see one of these up close and personal. Embraer, a Brazilian company, serves the market for planes that seat up to 130. That’s definitely smaller than our large jets. And although it’s around the size of a commuter jet, it seems unlikely that the folks flying local routes between regional airports are going to spring for a high-end plane. That said, SkyWest has apparently placed an order for 100 of them, so you may be one of the lucky few if you book a SkyWest flight in three years or so.